Tree of Life is basically two movies. The first is an affecting, beautifully shot family drama set in suburban 1950's Texas. 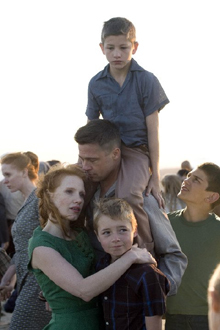 This is the one with Brad Pitt and Jessica Chastain and is a lovely portrait of a disciplinarian Eisenhower era father and a gentler mother who attempt to raise three boys in a world that is becoming disenchanted by the certainties with which everyone grew up. The visual trope Terrence Malick is going for in this part of his film is very much in the realm of realist painter Andrew Wyeth (although sometimes it's a little bit like the Pearl Jam video "Jeremy") and the whole thing works very well. The second movie in Tree of Life is the sort of film that got shown in 1970's planetariums. Its a history of the universe from the dawn of time to the present day. We get to see star birth clouds (images from the Hubble space telescope), the birth of the sun, the evolution of single celled creatures (in one quick scene we see mitochondria being captured by a cell), the colonisation of the land, the birth and death of the dinosaurs (via the Chicxulub event). I enjoyed this kind of film when I was 11 at Armagh Planetarium, but I'm not sure what it was doing in this movie. While I was watching it all I could think of was Carl Sagan's Cosmos and those Far Side cartoons about evolution (but of course this being a Terrence Malick movie there are not permitted to be jokes of any kind). As a planetarium movie it's not bad but I think I noticed two mistakes: I'm pretty sure Jupiter's Great Red Spot wasn't around at the time of the dinosaurs and you wouldn't have heard birdsong in the dinosaur forest because birds hadn't been invented yet. Malick wrote his PhD thesis on Heidegger and Heidegger said that death is the central fact of life and how we cope with death is essential to our being. Heidegger was famous for asking the big questions like: why are we here? and what does it mean to be alive? and how am I going to explain my flirtation with the Nazi Party after Germany loses the war? Tree of Life wants to ask these big questions too and I think it might have been more successful had it just concentrated on the Texas family. Reminding us of our insignificance in the big scheme of things - as if this is somehow news - doesn't really get us anywhere. I think it's possible that Malick has been following the wrong philosopher all these years. Albert Camus said the plight of man is absurd and insignificant but because of this insignificance living our lives becomes a heroic quest for meaning. Camus accepts the abyss and the chaos and laughs at it. The cheerful, dyspeptic Camus might be a better guide than gloomy old Heidegger and don't forget that when push came to shove and these two philosophical systems were tested Camus was on the side of the good guys in World War 2.